Oz Hotels allows holiday makers looking for cheap accommodation in Rockhampton to compare a range of independently owned and non-related hotels, resorts and apartments at the same time. 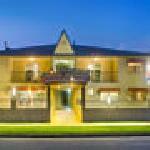 The accommodation on Oz Hotels ranges from luxury resorts and honeymoon suites right through to budget hotel rooms and family friendly apartments. With discount rates for longer stays you can comfortably book your next Rockhampton accommodation on Oz Hotels and take advantage of the great savings available. Rockhampton, affectionately known as 'The Beef Capital of Australia' and strikes a charming balance between a laidback country town and a modern city. This thriving city is the business hub of the Capricorn Region and is both a gateway to the Queensland outback and close to some of Australia's most unspoilt beaches at Yeppoon. Situated on the banks of the Fitzroy River, Rockhampton is renowned for its elegant streetscapes with majestic sandstone buildings and the iconic life-sized bull statues scattered around town. With a population of over 60,000 Rockhampton offers easy going country hospitality, quality shopping, fine dining and a wide range of entertainment options. Visitors to Rockhampton can walk along the Riverfront Boardwalk and take in the views of the Fitzroy river and historic Quay Street or pack a picnic and head to Mt Archer to enjoy city views and cool breezes. The Best Western Cattle City Motor Inn, Rockhampton offers 3.5 star hotel motel accommodation, ideal for both leisure & corporate travellers, close to the Rockhampton CBD, Botanic Gardens and the City Heart Mall. The Best Western Cattle City Motor Inn is located on the south side of Rockhampton, about 5 minutes from the city centre and within easy reach of shopping, dining and entertainment. You will be spoilt for choice as you explore all the hidden treasures of Rockhampton and surrounds. The Best Western Cattle City Motor Inn, Rockhampton offers a variety of hotel accommodation that caters for both the leisure and corporate traveller including Single, Queen, Family and the luxurious Spa Suites featuring a separate living area and two person spa bath. All guest accommodation rooms are recently refurbished, modern, comfortable, spacious and non smoking, offering reverse cycle air conditioning and heating, comfortable Queen/Single bedding, a private ensuite bathroom with shower, toilet, hair dryer and complimentary toiletries, broadband internet access, direct dial phone, modem line, dataport, ironing facilities, tea & coffee making facilities, mini bar, colour TV and FREE Austar TV. The television and air conditioner are all remote controlled for your convenience. Specially modified rooms that allow wheelchair access are available on request. The Best Western Cattle City Motor Inn, Rockhampton offers excellent guest facilities and services including outdoor swimming pool, an onsite licensed restaurant and cocktail bar, BBQ facilities and entertaining area, landscaped gardens, a fully equipped gym, a guest laundry, room service breakfast, dry cleaning / laundry service, interconnecting rooms, cot hire, luggage storage, tour desk, daily housekeeping and FREE undercover car parking. The Best Western Cattle City Motor Inn caters for corporate business travellers with direct internet access in all guest accommodation rooms and suites, faxing facilities and conference/meeting facilities. The Best Western Cattle City Motor Inn - recently refurbished budget accommodation at affordable rates in a central Rockhampton location, ideal for leisure or business. The Denison Boutique Hotel, Rockhampton offers luxury accommodation that will take you back in time. Built in 1885, Built in 1885, The Denison Boutique Hotel offers 4 star luxury heritage boutique hotel accommodation which has been brought back to life beautifully. Start your stay by being picked up from the station or airport in a 1938 Rolls Royce FREE OF CHARGE, then delivered to this heritage establishment, which is surrounded by roses and hedged gardens. All guest accommodation rooms have been newly renovated, featuring 4.8 high ceilings and classic heritage style furnishings to give you the relaxed feeling of being somewhere totally luxurious. Ideal for a couple, single or corporate traveller, all rooms offer the highest quality comforts including a King Size Four Posted Bed, 2 PERSON SPA BATH, 42" plasma television, reverse cycle air conditioning and heating, private balcony/courtyard, a private ensuite bathroom with shower over the Double Spa Bath, toilet, hairdryer and bathroom amenities, alarm clock, radio, DVD player, FREE Austar cable TV ( 5 channels), direct dialling phone, table and chairs, writing desk with lamp and chair, ironing equipment, fridge - bar size, tea/coffee making facilities and FREE WIRELESS INTERNET with unlimited usage!!! For your convenience, all rates include FREE GOURMET HOT BUFFET BREAKFAST FOR 2 EVERY MORNING!!! Further guest facilities and services include airport shuttle, arrival / departure lounge, dry cleaning / laundry service, interconnecting rooms. luggage storage, wheelchair accessibility, FREE Wifi, espresso coffee and imported tea, delightful landscaped gardens, daily housekeeping, disabled rooms are available with walk in shower and hand rails and FREE secure onsite car parking. The Denison Boutique Hotel, Rockhampton also caters for corporate business clients with FREE WIRELESS INTERNET in all guest accommodation rooms with unlimited usage, email facilities, fax facilities and photo copying service. The Denison Boutique Hotel is centrally located in the heart of Rockhampton, just a five munte walk from the Fitzroy River and shopping mall, close to restaurants, bars, theatres and the Great Western entertainment arena. The Denison Boutique Hotel is the newest hotel to open in Rockhampton, offering a very high standard of friendly service, delightful heritage accommodation in a fantastic Rockhampton location at affordable rates to provide a pleasurable and unique hotel experience. The Rocky Resort Motor Inn provides guests with quality motel accommodation centrally located 2 kilometres from Rockhampton. Perfectly positioned alongside the Bruce Highway, just 400m from the Tropic of Capricorn and only a short walk from the stunning Botanical Gardens and Zoo, The Rocky Resort Hotel Motel is within close proximity to the Rockhampton Airport and Queensland Rail Train Station. The property is 40 minutes drive from the beaches and islands of the Capricorn Coast, offering a range of motel accommodation options for business and leisure guests. All hotel rooms and suites are modern, spacious, comfortable and non smoking, stylishly appointed and providing the ultimate in convenience including soundproofing for guest comfort and privacy. The Rocky Resort Motor Inn Rockhampton also has a variety of guest facilities and services to suite corporate business travellers and leisure guests alike including a swimming pool, FREE WIFI internet, onsite a-la-carte restaurant, room service, free car parking, bar, tour desk, guest laundry, non smoking accommodation, newspapers, luggage storage and lots of business facilities. The Rockhampton Serviced Apartments offer stylish, modern hotel accommodation, as well as 1, 2 & 4 bedroom self contained serviced apartments which are ideal for families, holiday makers or corporate travelers looking for either short or long term accommodation in central Rockhampton. Conveniently located 3 minutes drive from the CBD, the Rockhampton Serviced Apartments are located close to all Rockhampton facilities including the botanical gardens & parks, boarding schools, churches, hospitals and shopping centres. Ideal for business or leisure, the Rockhampton Serviced Apartments feature a range of guest facilities and services including an outdoor swimming pool, free car parking, landscaped garden, free WiFi, luggage storage, non-smoking accommodation, a guest laundry, dry cleaning service and free cot hire. Centrepoint Motor Inn is the perfect Rockhampton destination for the corporate traveller on business or the tourist on vacation. The Centrepoint Motor Inn welcomes you to modern comfortable 4 star accommodation with the personal service you will appreciate during your stay. All 60 comfortable, well appointed rooms have been refurbished and are serviced daily. Property facilities include 24 hour reception,conference rooms, free guest laundry, a licensed a la carte restaurant (open 7 nights), cocktail bar, disabled chair lift, gym room, swimming pool, business centre as well as free undercover car parking and security. The location is ideal - right in the heart of the Rockhampton CBD and walking distance to the City Mall. Centrepoint Motor Inn, Rockhampton - the perfect place to unwind.